"The award-winning i1Display 2 delivers unrivaled color controls including Workgroup Match, Ambient Check and Match, Push Button Calibration and Validation—all essential tools for professional photographers and designers to attain accurate color throughout the digital workflow, whether in their own studio or in a collaborative production environment." Detachable ambient light head to capture ambient light measurements—also serves as a dust protector for your device! The i1 Display 2 product forms part of X-Rite's professional range of calibration tools, and offers additional features to their 'i1 Display LT' device which is entry-level. The Display 2 product offers Workgroup match, monitor validation and trending graphs, advanced user modes, user defined gamma and white point levels, luminance measurement, and the full i1Match software package. The i1 Display 2 Device retails for $249 USD. When you compare this to the LaCie products, the Blue Eye Pro is $369 and the trimmed down Blue Eye 2 is $299. Clearly the i1 Display 2 is good value for money considering it's the same device. We just need to find out if their software package produces good results. The aim of this review is really to discover how effective the i1 Display 2 device is in calibrating monitors. We already know that the hardware device itself is high end, and is used in several packages including our own LaCie Blue Eye Pro device we use at TFT Central. What changes however, is the software which accompanies the device and what is available in terms of calibration process and validation. As a control for these tests, I will also use the reporting feature of LaCie's software, which will show us several things, including luminance, gamma and colour temperature values reached by calibration. It will also show us the DeltaE (dE94) values for 16 colour shades, helping to show us how accurate the colours shown on the screen are. The X-Rite software package does NOT come with this reporting feature which is part of the reason the cost is lower than for LaCie's package. After calibration, the Dell 2405FPW showed very good colour accuracy with an average DeltaE of only 0.6, and a maximum of 1.1. LaCie would consider the colouor fidelity to be excellent. At default settings, the performance of the screen was far from ideal! Gamma was poorly adjusted to 1.7, colour temperature was recorded as 5803k and luminance was far too high at 228 cd/m2. With a black depth of 0.22 cd/m2, this gave a contrast ratio of 1036:1, just over the specified 1000:1 for this display. 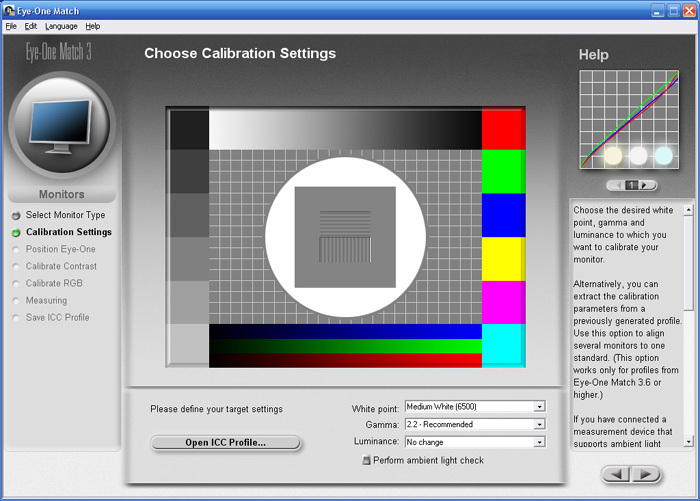 I loaded up X-rite's Eye-One Match software (v 3.6.1) in order to carry out calibration with the X-rite device. 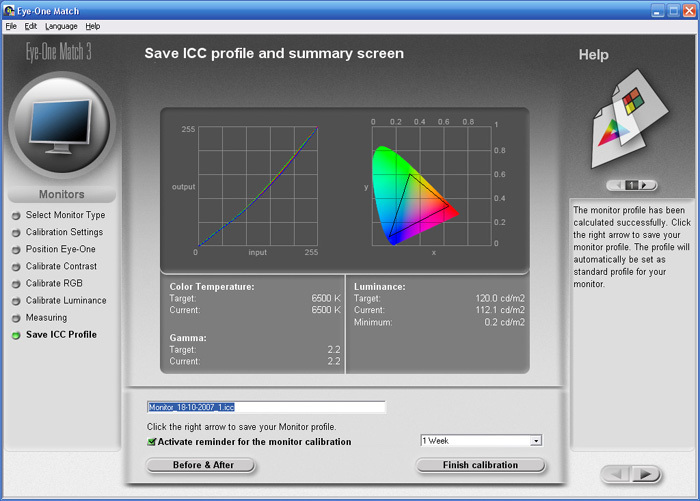 The software gives several options including a selection of languages, a choice of whether the ICC profile is created according to the ICC v2 or v4 specification, and whether the profile size is small (matrix) or large (LUT). You can also choose which type of device you are calibrating, and as you can see from the image above, this can be a monitor, projector, scanner, printer or camera. There is a guide section on the right of the screen giving you help as you go along. There is an easy and advanced mode to choose from, I'll stick with the advanced mode which just gives you access to more options and settings. On the next section you are asked to define your target settings for the calibration. I will select 6500k colour temperature, 2.2 gamma and 120 cd/m2 luminance, for reasons already discussed. The next stage asks you to position the device on the screen, and the software removes any previous calibration settings you may already have in place. 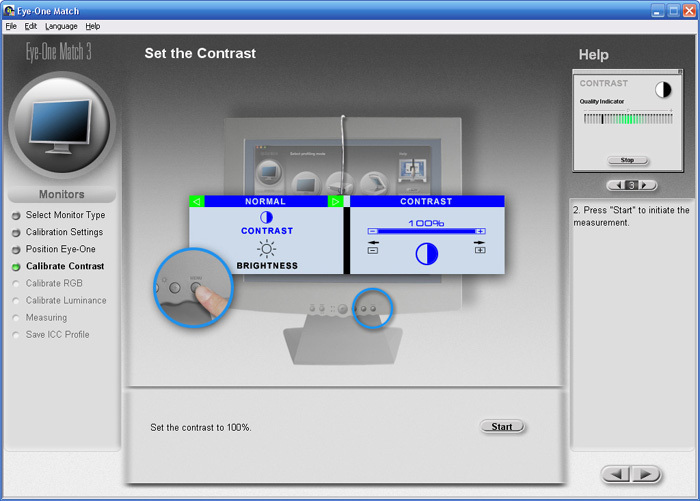 The next stage guides you through configuring the best settings for contrast. Following the settings, you need to first set the contrast to 100% and then adjust it during the testing stages. 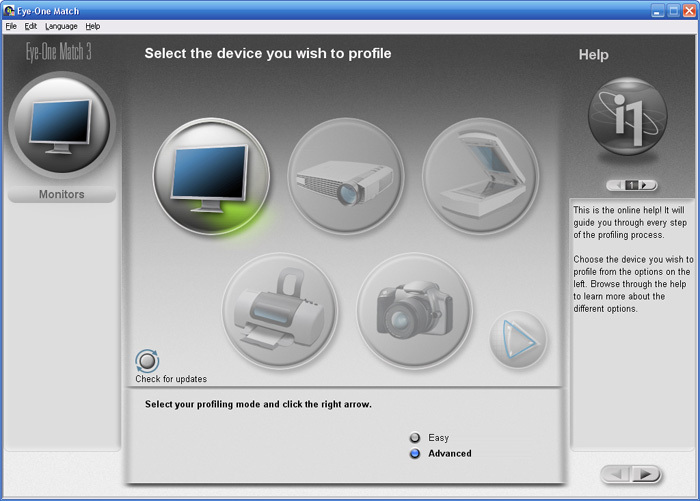 The software features the ability to detect where on the screen you have placed the device. It can be positioned anywhere, and a series of squares are shown in order to determine the exact location of the probe. Having set contrast to 100%, you then adjust the setting until the optimum level is reached, indicated by a sliding bar scale as shown in the top right of the image. You are then asked to adjust the 'white point', which will adjust the RGB levels of the screen and hopefully improve the colour accuracy. 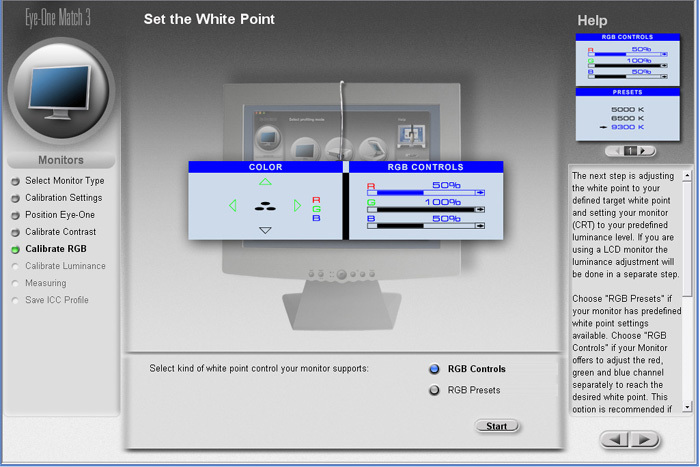 The help guidelines suggest you need to access your screens OSD to alter the RGB levels, but does give you an option if you only have preset modes. For our test screen, we have access to these adjustments. Again the software locates the device on the screen, before flashing up a red, blue and green background. 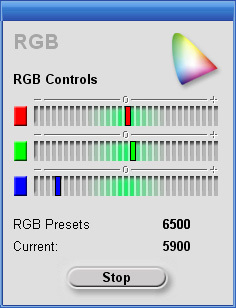 A white background is then shown and the RGB levels are then shown by a sliding bar scale. 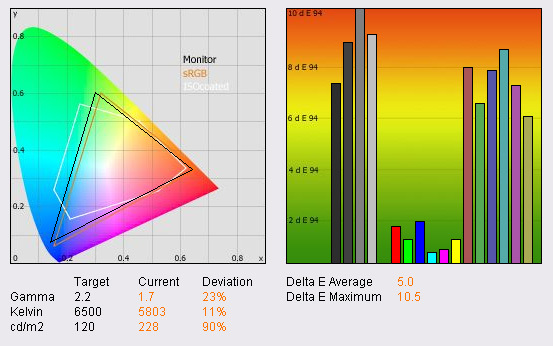 Initially, you can tell the RGB levels are way out, and the RGB preset colour temperature is currently recorded as 5900k, quite a difference from the desired 6500k. 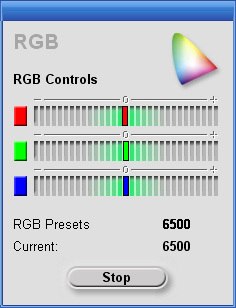 By adjusting the OSD RGB settings to 33, 32 and 34 respectively, I was able to move the slide bars to the desired central position as indicated by the software. 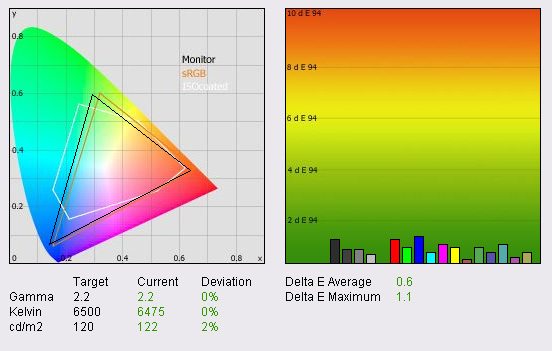 The measurement now showed an RGB level of 6500k, reaching the desired setting. The following stage asks you to calibrate the luminance (brightness) of the screen. With a target luminance of 120 cd/m2, it was necessary to adjust brightness in the OSD to as low as 7 (from a default 50%). The software relies far more on OSD adjustments than LaCie's software does. With the LaCie suite you are able to leave the brightness setting at a much higher value if you want (typically I have it around 30%), and the calibration process adjusts settings at a LUT / ICC profile level instead. 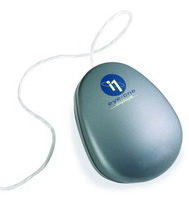 Nevertheless, the desired 120 cd/m2 was reached. The next stage is an automatic calibration adjustment which take approximately 3 minutes to complete. After which you are given some results as shown above. Colour temperature is confirmed as being corrected to 6500k as desired. Gamma is also now recorded at 2.2 as we hoped. 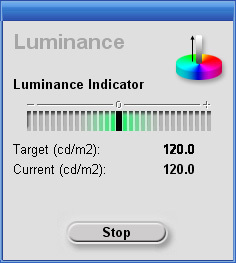 Luminance is 120.1 cd/m2 and black depth is listed at 0.2 cd/m2. Note that the black depth reading is rounded to the nearest 0.1, and so alternative software is needed to determine if this is between 0.15 and 0.2 cd/m2. You are also given the option to save the calibrated ICC profile and whether you want the software to remind you in the future to re-calibrate the screen. The CIE digram is on the right hand side shows the colour space of the monitor. This doesn't really change, and since there's no reference (sRGB, NTSC space etc), it's fairly useless. The left hand side shows a gamma curve. Gamma curves are graphs that show the dependence of the signal coming from the graphics card and the brightness of the pixel on the screen. This is an exponential dependence and the exponent is referred to as gamma . It's hard to tell from the image, but there is an 'ideal' curve shown by a black line, and then the corresponding red, green and blue curves are shown. In this case, the curves are all very similar, and close to the ideal gamma curve. If these were spaced out more, it can result in poor perceived contrast in certain tones and often can lead to banding in colours. The result from the calibration shows the gamma curves are well set up. I activated the profile and exited the software in order to validate it's success. Since the i1 Display 2 doesn't feature a test and report function, or a measurement of DeltaE values, it is necessary to go back to LaCie's software to determine how successful the calibration was. If you compare these results with the default settings shown earlier on in this review, you can see there is a vast improvement. Gamma and colour temperature were now spot on at 2.2 and 6500k respectively. Only luminance was a little out at 109 cd/m2, being 9% out from the desired level. DeltaE was on average 0.6, and with a maximum of only 1.8. This was not quite as good as the results achieved during the calibration process of LaCie's own software, but was still very impressive. The screen felt much more comfortable than at default settings, and colours were vivid and even. Black depth was recorded at 0.15 cd/m2, giving a contrast ratio of 727:1. Overall, the calibration process with the i1 Display 2 software was easy, with some good guidance as you go through. The process didn't take too long, perhaps 10 minutes in total, and the results were certainly pleasing. Obviously the device itself is capable of some high end results and so buying the i1 Display 2 (aka Eye-One Display 2) package is certainly a more cost effective way of getting the hardware colorimeter tool ($249 USD) than buying LaCie's Blue Eye Pro package ($369 USD). For users wanting some good calibration performance, and a more affordable price, the X-Rite device is certainly worth a look. For the purposes of our monitor reviews here, it is extremely useful for us to have test and report functionality of LaCie's software, and DeltaE results are very handy. This is the only main thing missing from X-Rite's software package and as such, it is not as useful for a reviewer or someone wanting to verify the calibration results. You could always consider purchasing the device at X-Rite's reasonable price, and then pairing it with alternative software from another provider. This is one option, but for many, the packaged Eye-One Match software will suffice.